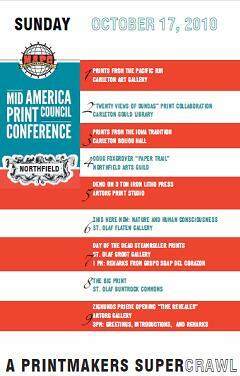 Several groups in Northfield, Minnesota are holding no fewer than nine events in conjunction with the Mid America Print Council’s 2010 “New World / Old World” conference. This events are scheduled during the last day of the conference, Sunday, October 17, 2010, and buses to and from the main Minneapolis conference site are being organized. For open hours outside of Oct. 17, please consult the individual organizations. You do not need to be registered for the conference to take part in these Northfield-based events. This exhibition presents new work by artists from New Zealand, Australia, Japan, Canada and the United States (Hawaii), each engaging with printmaking as a sustained research project. Prints Around the Pacific Rim emphasizes artistic exchange, as well as indigenous and global influences. Celebrating this influential printmaking center, with works by Mauricio Lasansky, Leonardo Lasansky, Takeshi Takahara, Malcom Myers, Dean Warnholtz, Lee Chesney, Wendell Black, H.C. Cassill, David Dreisbach, Sylvia Schuster, John Paul Jones, Kurt Kemp. Steven Nuno Nunez will be on hand from 11am to noon to talk about his experiences printing for this twenty-artist collaborative print suite. Includes work from Carolyn Swiszcz, Xavier Tavera, Hope Cook, Jame Boyd-Brent, Fred Hagstrom, John Saurer and 15 others. Northfield Arts Guild, 304 Division Street S.
This Northfield artist explores the dialog between pixels, print and paper. ArtOrg Printmaking Studio, 314 Division Street S.
Join ArtOrg as we demonstrate lithographic printing with aluminum plates on a 6000-pound 50-inch-wide cast-iron litho press. Light refreshments will be provided. THIS HERE NOW: Nature and Human Consciousness is an exhibit of historical and contemporary art that addresses questions of deep philosophical and religious significance: what is consciousness and meaning? The exhibit will include historical and contemporary prints from the prints and drawing collection at the Minneapolis Institute of Arts. There will be a reception co-hosted by the Latino Grupo Soap del Corazon and ArtOrg at 1 pm for two projects of large-scale steamroller printing around the Day of the Dead. For the first time in 2006, thirteen artists came together to produce four-foot-by-eight-foot woodblock prints in a project that was ultimately accessioned by the Weisman Museum at the University of Minnesota. In 2009, nine artists produced a similar set of works in front of the Plains Art Museum, in Fargo, North Dakota. Most of the 22 prints will be on display. Also included in the Groot Gallery will be additional prints from the St. Olaf collection. 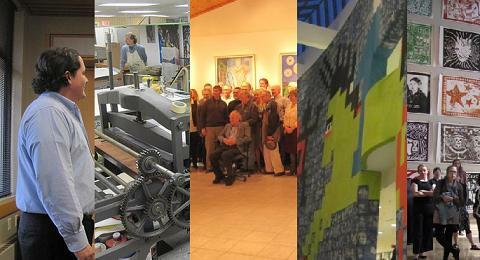 The “Thousand Print Summer” event traveled to ten venues and printed for 1180 kids and adults. The Big Print is a collaborative work from those reprinted blocks and the result is displayed on the three-story-tall wall in the atrium of Buntrock Commons. 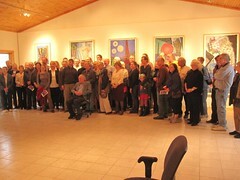 ArtOrg Gallery, 26601 Chippendale Avenue, Northfield, MN 55057. Six miles north of Northfield on Highway 3. Zigmunds Priede will be exhibiting several new works in his exhibition titled “Time Revealed”. Mr. Priede was a printmaking professor at the University of Minnesota from 1964 to 1978, and was Master Printer for Universal Limited Art Editions starting in 1962. At Universal, he printed seminal works for Rauschenberg, Johns, Newman, Motherwell, Rosenquist, Frankenthaler, Dine, and others. At the University, he inspired many students in art, and some students to indelible printmaking careers of the highest level. We are expecting several surprise guests at the opening on Sunday, October 17, 2010.